Once upon a time I encountered a need to write a windows service that would monitor my computer's WAN IP and notify me of the changes. I discovered that this was a perfect opportunity to "do it right": this task was complex enough to be practical, and yet simple enough so I could concentrate not only on the problem itself, but also on the surrounding boilerplate issues like logging and installation. This is how the IP Watchdog service was born. The service must be self-installing, without necessity to run installutil. The service must be able to run in console mode, logging output to a console window. While in windows service mode, the service must write to Windows event log. It must be possible to start and stop the service using the service executable itself. Service code must serve as an example of good coding practices and as a "template" for other services I write. I will be using Git source control when developing it. The source code (15K ZIP archive) is available here: IpWatchdog.zip (15K). My home network is connected to the Internet via cable, and my cable modem has "almost static" IP, that changes maybe two or three times a year. Naturally, I want this IP to be mapped to a friendly name, like home.ikriv.com. I tried to use dyndns.org service back in the days when it was free, but after 30 days without IP change notifications it would kick me out. Since the IP changes so rarely, I don't see a point in paying additional money for static IP. However, it does change from time to time, and then I cannot access my home until I physically get there, check what new IP is, and change the DNS settings for my domain. After yet another outage I decided that I had enough. I needed some agent that would monitor my home IP, and send me an e-mail notification when a change occurs. I could receive e-mail on my mobile phone, and then access my domain DNS from wherever I happen to be at the moment. Of course, I could try to find an existing service, but this task sounded like fun, so I spent a day writing it. I also wanted to refresh my service-writing skills, and do it right, with installer code, event log notification, console mode, etc. So, in a way this service works as a cheat sheet for boilerplate tasks like "how do you install a service without using InstallUtil". If I need to write another service, I will not have to reinvent the wheel. Check current external IP by reading it from checkip.dyndns.org. Compare to previous value of IP. If different, send notification e-mail. Wait for some time and repeat. This code uses some dependencies: _retriever is a class responsible for reading the IP from the web, _notifier sends e-mail notifications, and _persistor saves IP value between service invocations. Stopping the service means stopping the timer. If IP check is currently underway, it acquires a lock on the _isBusy object. The stopping code tries to obtain this lock using .NET monitor: this is (allegedly) more efficient than full-blown mutex. If the lock cannot be obtained in 5 seconds, we assume IP checking process is stuck and exit without further wait. Unless your server is directly connected to the Internet, its WAN IP address is not the same as its local IP address. Below is a typical structure of a home network. 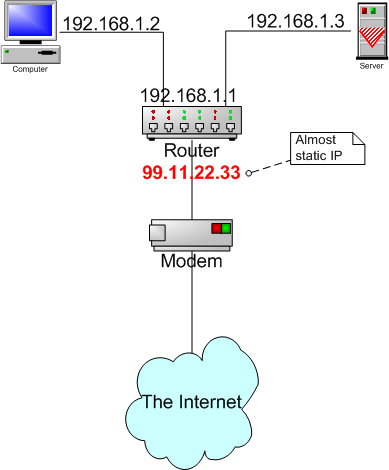 For the software running on the server, there is no direct way to find out its WAN IP address (99.11.22.33 on the diagram above). All it can know is local IP address (192.168.1.3). The only reliable way to find out the WAN address is to send a request to someone on the outside and ask where it came from. From there we can extract the IP address by simple string manipulation. Current implementation of Web IP retrieve is synchronous, i.e. it blocks the timer callback until the answer comes. It would be better to implement it asynchronously, but then answer reading and service stopping logic would become somewhat complicated, so I bailed on it. 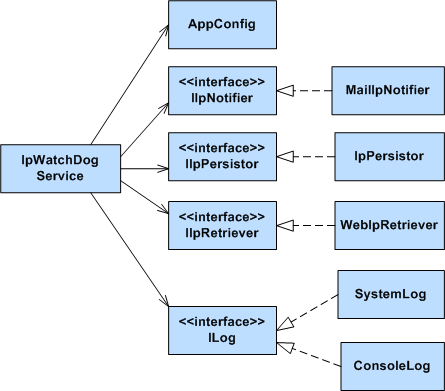 The service logic that implements IService interface and is agnostic to the way it is run. The ServiceRunner class that runs the logic as a Windows Service. The ConsoleRunner class that runs the logic as a console application. Service mode is invoked by default, console mode is invoked via -c command line switch. It would be nicer if console mode were the default, but it requires passing command line arguments to a service. This is possible, but it's a pain if you use stock service installer provided by the framework. The console runner runs the service and waits for the Ctrl+C combination to be pressed. The service runner inherits from ServiceBase and implements OnStart() and OnStop() methods by calling service's Start() and Stop() respectively. We also need different logging mechanisms for console and service mode. 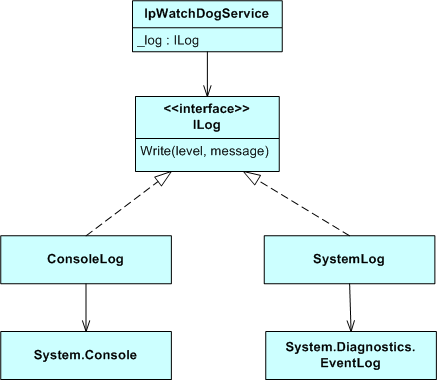 We abstract logging with ILog interface, and that interface has two implementations. ConsoleLog writes output directly to console, while SystemLog writes to the "Application" event log displayed by "Event viewer" application. I am not a big fan of a graphic designer for something as code-oriented as a service. I don't like the names like ProjectInstaller1, and renaming them is a pain. You are supposed to use installutil.exe to run the installer. This is ugly and difficult for the users. In light of all that I wrote my own InstallUtil implementation, based on this example. It mostly deals with calling AssemblyInstaller class and providing error handling around it. I also created a ProjectInstaller class similar to what the wizard would create for you, that calls ServiceProcessInstaller and ServiceInstaller. Note that my service run under NetworkService account, since network is all it cares about. Also, it looks like you don't need a special installer for eventlog event source, ServiceInstaller will create event source for you. The service installs itself when invoked with -i command line switch, and uninstalls when invoked with -u switch. As application parameters such as polling interval, notification e-mail and SMTP server address don't frequently changed, I put the in an app.config file. You will need to modify that file before you run the service for the first time. The AppConfig class encapsulates access to the file. Single responsibility means that each class is responsible for one thing. If you have to use the word "and" when describing class duties, it is a bad sign. Single responsibility results in small lean classes that are easy to reuse and may be combined in a variety of ways. This is the same principle that stands behind very successful UNIX tools paradigm: each tool does one thing, but does it well. Whenever we have multiple implementations of the same concept, like in case of logs, we must have an interface. Sometimes it is beneficial to have an interface even when there is only one implementation, e.g. to make the contract explicit and get rid of unwanted dependencies. 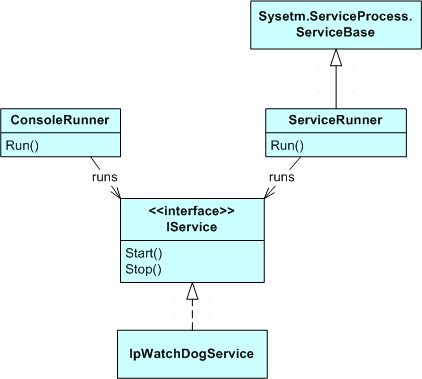 For instance, I could make ConsoleRunner depend directly on IpWatchDogService, but it does not make much sense, since the runner does not really care what kind of service it runs. I hope you enjoyed reading about the IP watchdog as much as I enjoyed writing it. I also hope that it will relieve you from writing boilerplate code and allow you to concentrate on the task at hand instead. Feel free to borrow the code and use it for your needs (see legal section for details). In IP Watchdog version 1.2 I added an option to run an arbitrary command instead of sending e-mail. The source code is here (github), binaries are here. Version 1.2.1: fixed a stupid bug with intiialization of _log variable caught by Henk Janssen on CodeProject, and another one caught by the compiler. Binaries and source code updated accordingly.